Nothing like fresh Spring herbs to make your meals tastier! Amazon has these Herb Scissors for Only $6.99! (Reg. $22) They come with a cleaning comb to get out all the bits! SUPER SHARP BLADE – Two Snips With This Sharp, Finely Balanced Five Blades Equals 10 Knife Chops. 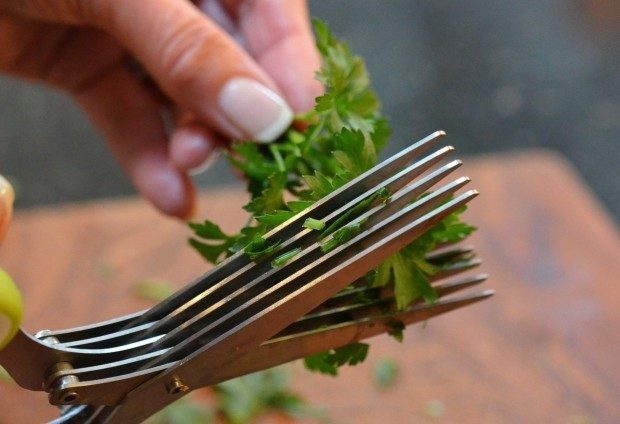 HANDY COMB – Achieve Minimum Mess With One Quick Swipe And Push Stubborn Clinging Herbs With Ease. FOOD SAFE – BPA Free, FDA Approved Made From 100% Food Grade Highest Quality 18/8 Stainless Steel. EASY TO USE – Make Cutting, Chopping, Trimming & Snipping Herbs Like Basil, Thyme, Parsley Super Easy. 100% DISHWASHER SAFE – Durable, Stylish & Rust-Proof Scissor Is Super Easy To Clean With Hands Too.